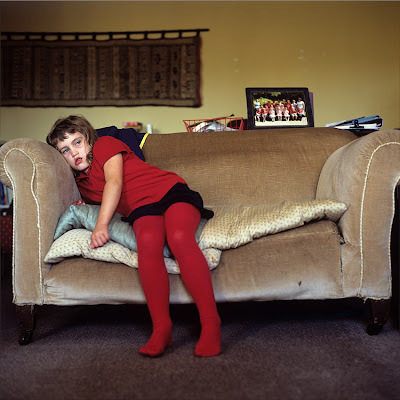 I am delighted to have my Sofa Portraits in the Global Photography show at the Photo Festival of Savignano in Italy. Curated by Massimo Sordi and Steffania Rosl, the show is part of a year round photographic project in Savignano that focuses on the connections between identity, environment and culture - lots of fabulous and familiar names in there, with a strong focus on concentrated portraiture. I really wish I could be there because it sounds great and Massimo and his gang are so charming. Good luck to you all - basi, basi. Wonderful,she's like the little girl who fell from the picture and missws her friends. Thanks Darrell - I like that vision. It's tragic! Moving portrait photo! You really have caught the moment. Lovely company, Simon - hope you had a great summer in Sweden.